How about lifting system of HZQY900t beam launcher? 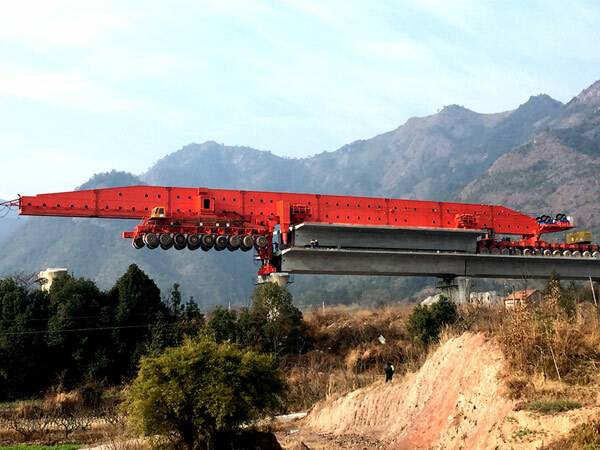 Lifting system of HZQY900t beam launcher is used to lift and lower down 900t precast girders with full span method. The lifting system is made up of winch and lifting devices; each winch is set with one coiling block; the motor equipped with one multiple-piece normally closed brake drives the coiling block by reducer; the winch is set with limiting stopper to limit lifting and lowering extreme position, coder to control revolving speed and extreme position of coiling block; the winch is installed on winch support at one end of main girder; emergency brake on the flange plate of coiling block could control the overspeed and emergency stopping. Operation poles for moving and lifting are equipped with locking buttons to avoid wrong operation. Girder lifting system could realize 3-dimension positioning exactly by 4-points lifting and 3-points balance method.